Nature Balance Wellness sent me a 3 piece Yarrow and Rosemary facial for oily skin, consisting of Yarrow and Rosemary Deep Foaming Cleanser, Yarrow and Rosemary Clarifying Toner and the Yarrow and Rosemary Light Daily Moisturizer as well as an assortment of other products. However, I thought I would review this facial collection separately from the other products. I began by reading the list of ingredients, as per usual. Containing 68% organic ingredients, I was happily surprised that the first ingredient listed on the Yarrow & Rosemary Deep Foaming Cleanser was Rosemary Tea brewed with Purified water. An infusion is an excellent way to collect all of the oils from the herb. Imagine how giddy I became, giggling as I showered, knowing full well I was washing my face with a blend of Rosemary Tea and Vegetable glycerin and other fine ingredients. Something about that sheer fact alone had my inner child quite excited. 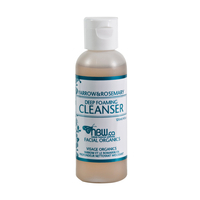 The Yarrow & Rosemary Clarifying Toner contains 20% Organic Ingredients and the very first ingredient is Witch hazel Distilate! Witch Hazel is absolutely wonderful for the skin!The second ingredient is Rosemary Floral water. Now for those of you who are unaware, Rosemary Floral water (Rosemary in general) is said to be wonderful for for acne or oily skin. All of the products worked wonderfully except I found the Yarrow & Rosemary Light Moisturizer to still be a touch to heavy for my skin. I live in a very humid, coastal region of Canada so it still doesn't quite put my skin in balance. 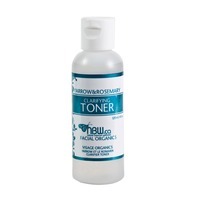 I had much more success keeping the oily shine down on my face using only the Cleanser and the Toner. With the holidays fast approaching, the facial products from Nature Balance Wellness makes a wonderful gift idea. I received a small package containing various incense sticks to sample and review from Pure-Incense. The incense is crafted according to the ways of the ancients instead of the modern commercial world and was originally intended for temple deity worship. It wasn't even discovered by the Western world until the 1960's. The Absolute Sandalwood smelled earthy and sweet. It burns very pure and it did not aggravate my delicate sinuses like cheap store bought commercial incense. A very comforting and calming scent, sandalwood promotes well being and has a 4000 year history as a meditative aide. While burning a stick of Frankincense our neighbor Darby came over, having previously spent a few months in India he found it quite strange that particular stick of incense smelled "so much like India". It was as though he walked into another country. Upon first smelling the Absolute Agarwood, I was taken back to my childhood. It reminded me of the more masculine scents in the bathroom at my grandparents house growing up. I pondered if my grandfather used a product that contained Agarwood (Oud) oil. It is a very woodsy scent with a hint of spiciness. The Agarwood burns a little thicker than the Sandalwood but I adapted to it very quickly. It a very therapeutic and relaxing scent which serves to reason considering Agarwood has been used in ritual meditations for many generations. The more I inhale the aroma, the deeper the relaxation. Did you know that Agarwood is produced from a diseased Asian fur tree fighting a fungal infection? Night Queen smells nothing like the first two sticks. It is Jasmine dominant with a note of another scent that I cannot put my finger on. It is pungently aromatic and I do understand the correlation between the jungle reference in the product description. Something in its aroma reminds me of growth and dense foliage. Hari Leela reminded my husband of an old friends home. It has a very stimulating and woody smell. I really enjoyed both the quality of this incense so much I placed an order for bundle of assorted scents! Earlier this week, I reviewed some Herbal supplements from a lovely company called Organic India that started off in the 1990's as a small company and now have various offices located around the world. "Real silence is when you have a silent mind, even when you are speaking." Today, I am going to talk about a couple of the teas that Organic India sent me to review. 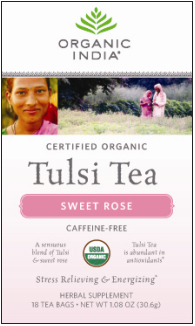 All of Organic India's tea's contain Tulsi or "Holy Basil". As posted on the Organic India, the health benefits of Tulsi are many. "Modern scientific research offers impressive evidence that Tulsi reduces stress, enhances stamina, relieves inflammation, lowers cholesterol, eliminates toxins, protects against radiation, prevents gastric ulcers, lowers fevers, improves digestion and provides a rich supply of antioxidants and other nutrients. Tulsi is especially effective in supporting the heart, blood vessels, liver and lungs and also regulates blood pressure and blood sugar." Dr. Ralph Miller, former Director of Research for the Canadian Dept. of Health and Welfare. Upon first opening the individual package the sweet aroma of rose petals immediately entrances you. The infused aroma is sweet, sensual and earthy. The result is a calming cup of relaxation, why not clear your mind for a while. I also received a 100g tin of Certified Organic Tulsi Orginal loose tea which is the Proprietary standard blend of Krishna Tulsi, Vana Tulsi and Rama Tulsi. I really enjoy this tea a great deal and I can see it quickly becoming a part of my daily regimen. It is earthy and I feel very comfortable while drinking it. I started adding it to food in small amounts as well. In fact, I made myself a Greek salad the other day and in place of the fresh home grown Oregano that I usually sprinkle on top of my salad, I sprinkled Holy Basil instead. It was delicious. I would recommend the same for pasta and even pizza crust. I really encourage you to explore the entire product line at Organic India, you might find exactly what you need. Disclosure: I received this product for the purpose of this review. 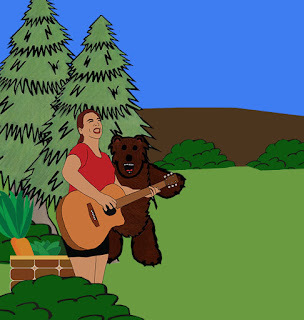 All of my opinions are honest and are based upon my personal product experience. Your experience may be different. I received no additional compensation for this review. The Eternal Truth exists within you. Do not entertain a single thought and the Truth will reveal itself to itself." 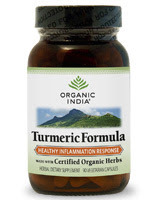 Formulated for Healthy Inflammation Response, Organic India's Turmeric Formula has been created with the healing attributes of Turmeric. Turmeric has known blood purification attributes and aids the lymph system in cleansing the body thus improving inflammation and immune response. Any Precautions when taking Turmeric? If you have any upcoming surgeries or are taking anti-coagulation drugs like Warfarin it is not advisable to take Turmeric as it will increase both the strength of the drug and the risk of bleeding after surgery. In fact, it is recommended to discontinue use of Turmeric by mouth 2 weeks prior to having surgery to insure proper coagulation. In India, Holy Basil is revered as "The Queen of the Herbs". 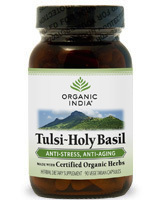 Holy Basil (aka: "Tulsi") is a stress fighting adaptogen that builds energy and stamina. We all understand the link between stress and the immune system. This makes Holy Basil a wonderful immune system supporter. Additionally it helps support the body's natural detoxification process and helps supports mood stability, all of the wondrous things that come with stress reduction. I received both of these compounds to review as well as some teas which I will review seperately. I am very impressed with both of these compounds. The herbal supplements have been finely ground and precisely measured. I can almost visualize the mortar and pestle and the care put into each ingredient right now to the finest of details. The herbs are contained within vegetable cellulose capsules. Despite being contained, you can still taste the herbs through the capsule so it a good idea to have a glass of water on hand to immediately wash them down. I didn't have a problem ingesting these formulated capsules although a friend of mine with a sensitive belly found them to be a little heavy on her system without food in the belly.